Duplicate photos are a nightmare. They accumulate really quickly, clutter your photo albums and take up lots of disk space. Worse still, they are very hard to find because they usually have different file names and are scattered across different folders. That's why the fastest and the easiest way to delete duplicate photos is to use a good duplicate photo finder program. With Easy Duplicate Finder™ you can find duplicate pictures in your albums quickly and accurately. All it takes is a quick scan and the program will list all duplicate photos sorted into groups for easy management. Easy Duplicate Finder™ supports all popular image formats including RAW and PSD, and has a scanning engine optimized for processing image files. In addition to that, Easy Duplicate Finder™ has a handy Preview feature that lets you preview the duplicates before you take any action so that you don't delete any photos by accident. You can configure Easy Duplicate Finder™ to search only for image files by clicking on the “File Types” button and choosing ‘Image Files’. This way the app won't be wasting time scanning any other files. With Easy Duplicate Finder™ you can scan your PC or Mac for duplicate JPG, GIF, JPEG, PNG, TIFF, BMP, RAW, PSD and other popular image formats. You can choose to search for duplicate photos using the "CRC32 Checksum + File size" and even compare files by their content. 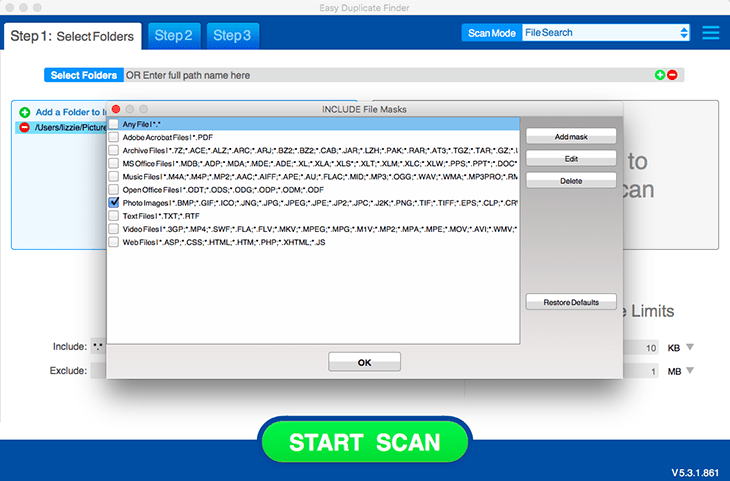 Once the scan is complete, go to Step 3 and review all detected duplicate images. Make sure the Preview feature is on so that you can preview the images before you delete, move or rename them. When you're done selecting the duplicates, simply delete them all in one click. Try Easy Duplicate Finder's duplicate photo finder today and get rid of duplicate images quickly and easily.